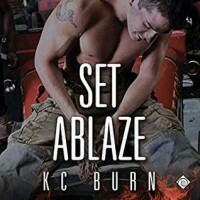 'Set Ablaze' is essentially a second chance romance with some mystery woven in. When Hayden's best friend, Miguel, asks him to take in Jez, his younger brother, Hayden's not thrilled with he idea but it's his best friend and he gets it...Miguel lives in a small one bedroom apartment while Hayden has a two story house all to himself. So reluctantly he agrees. After all how bad can it be it's just until Jez gets his own place and it's not like he doesn't have the room. For Jez seeing Hayden again brings back memories of his teenage crush, but he's sure that Hayden's straight...until he discovers that he's not. As Hayden and Jez get to know each other again both men struggle with their attraction. Jez is hasn't been totally honest with either his brother or Hayden about the real reason that he's run to California. He's running from a relationship that's gone bad and left him with more than a couple of issues of his own. Plus there's his other secret an adorable, small, furry secret named Fang...Jez is sure that Hayden hates dogs and Jez needs a place to stay...at least for a little while. Hayden may be out about his sexuality but that doesn't necessarily mean he's currently in or has had any relationships because even though he doesn't consciously admit it he knows that telling his fellow firefighters he's gay is one thing having them see it in the form of him in a relationship is totally another issue. Some of the men who Hayden calls 'friends' are to say the least less than friends and more than a little homophobic and it takes Jez's determination to never again be anyone's victim and his courage to speak out to make Hayden see that his feigned indifference not only isn't what's needed but it's in fact endorsing their behavior. Being out while still in the closet isn't Hayden's only issue and Jez is going to have to be both patient and persistent if he wants to get to the heart of Hayden's compulsive tidy/cleanliness. I definitely appreciated that the author addressed this issue because too often society would rather feign indifference...don't make waves, don't cause a scene...does any of this sound familiar? I think we've all heard something like this before and while the author didn't delve into this intensely it was part of the story but not an overwhelming part of the story and that's as it should be because it's the relationship between Jez and Hayden that's the story's focus. The social issues are wrapped in with this and definitely a driving force contributing to things ending up where they did. Just as in real life neither of these men have been molded by any one particular incident in their life but they are an amalgamation of events both big and small. The relationship between Hayden and Jez was to say the least built on a lot of awkward moments, definite miscommunication or more accurately a lack of communication because that's what happens when people keep secrets...poor communication and this wasn't helped by Miguel's lack of information sharing. Sadly both of these men have experienced abusive relationships of a very different nature this is far more reflective of the real world than it should be and as is often the case real life is stranger than fiction but fiction is frequently a reflection of real life. Just like his brother and friend Miguel is also a creation of experiences and circumstances and while he initially seemed like a member of Hayden's Asshat Brigade, he turns out to be a big brother who just wants to protect his brother and his friend from them. Admittedly there were some things about the story that could have been better or different but overall this for me was a sweet story about two men finding comfort and healing together allowing themselves to move on and build a life together. Darcy Stark was the narrator for this audio book and while this was only my third time listening to this narrator. It was also the third time that I've been treated a very enjoyable audio experience. I enjoyed his voices and the expressiveness of his voice. This is definitely an author & narrator combination that I'm looking forward to hearing more from in the near future...I mean I might have 'North on Drummond' cued up in audio list...I guess you'll just have to wait for the review. An audio book of 'Set Ablaze' was graciously provided by the publisher in exchange for an honest review.